Deerhounds may no longer be working for a living in the Scottish Highlands but who is doing our job now? Keppoch on the Isle of Skye is part of the John Muir Trust conservation project and the woodland area is at risk from the Red deer. Now if I had my way as a Scottish deerhound, the risk could easily be reduced as we deerhounds know best how, but with the law being what it is in the UK today, other methods of deer control are employed. 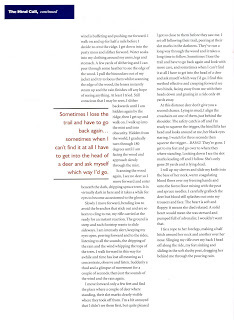 That’s not to say we deerhounds don’t still tag along for the sake of nostalgia and here in this article culled from the John Muir Trust members newsletter, you can observe a family member with Lester Standen just along for the ‘Look See’. 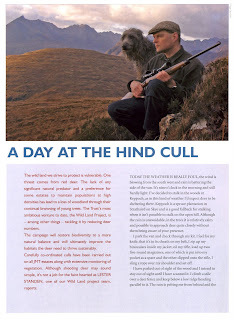 Read the article to discover the humane way of deer control at Strathaird and then wonder to yourself, could a deerhound possibly assist here? . 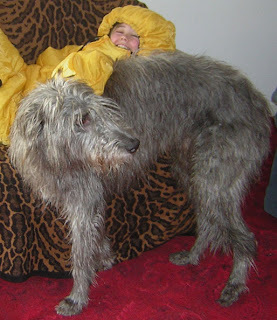 . . especially when one arrives at the third last paragrah of the article - Deerhound needed? Ah well - in a different world perhaps. Why not consider joining the John Muir Trust - and help preserve some wonderful and truly beautiful locations on earth like Yosemite, Skye, Ben Nevis, Schiehallion to name but a few. All places that deehounds truly love. Visit here for joining information. Recently a friend was commenting to the effect that blogs are nothing more than collections of what people think should be posted on the web (and usually culled from other websites). I thought to myself - isn’t that what near everything on the web is ? Then I considered my own blog. Yes, I’m a dog and this is a collection of what I think should be posted on the web, but this includes events that I have been participating in, artwork I appreciate and have collected, tales and histories I have discovered from various source, videos I have recorded and the list goes on. This lead me to discover this, Dogs with Blogs. Follow the link and discover that not only people are publishing to the bloggosphere but we canines are a plenty. Perhaps you are here and have dropped in on my blog - drop me a comment and let me know. A simple walk on the back streets of Edinburgh in Scotland, browsing the many antique dealers is sure to turn up Scottish deerhound or Celtic hound objects - take this little example - discovered Friday last - a silver brooch with blue eye, featuring the deerhound at the chase. And just for a spot of internet fun, simply because you can - visit this site to learn some dog speak. 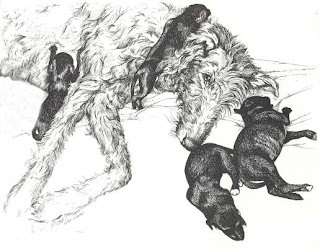 Deerhound eats Jack Russell pup! Mungo Minnie from a youtube, deerhound, discovery. Very interesting line of questions from someone who needs to experience country life I fear. The following article I have reproduced in full (excluding the images credited) from The Grey Dog of Meoble written by Mike Dash at his rather excellent blog. Follow the usual links. Somehow this unusual tale which brings together two distinct folklore motifs: those of the ‘loyal pet’ and the ‘harbinger of death’ may be strangely apt on this day of love and tells of the bond betwixt hound and human. The Grey Dog of Meoble (which I have seen given, in the Gaelic in which the story was first told, as an cuth glas Meobhail or an cu glas Mheobail) is a gigantic, shaggy-haired Scottish deerhound whose preternatural appearances are said to presage death to members of the Macdonald clan in the south Morar districts where the tradition first flourished. Tales of the spectral animal’s appearances certainly date to the first half of the nineteenth century; we know that Caraid nan Gaidheal, a renowned Highland piper who died in 1867, had heard the legend (John Gibson, Old and New World Highland Bagpiping (Montreal: McGill-Queen’s Press, 2002, p.318). They come not only from the tiny crofting hamlet of Meoble (pronounced “Meeble”) – a settlement, now all but abandoned, in an isolated district a mile from the shores of Loch Morar – but from other parts of Scotland and even Canada. ‘lived alone and had been confined to her room for many years and a friend who lived across the street was in the habit of calling each day to attend to her needs. On one occasion as the friend was leaving the flat, a large dog, of a type she had never seen before, passed her on the stairs. She thought no more about it until the following day when, much to her surprise, she saw it again, this time lying on the old lady’s doorstep. With difficulty she pushed it aside and went in. In the course of the conversation, she happened to mention the dog. Her friend sat up in bed her eyes alight. ‘“Describe it to me,” she said in a low voice. The tale of the old lady of Glasgow features several of the characteristic motifs of the Grey Dog canon – the hound’s enormous size (‘the size of a Shetland pony’) and, for all its ghostly attributes, its distinct corporality. 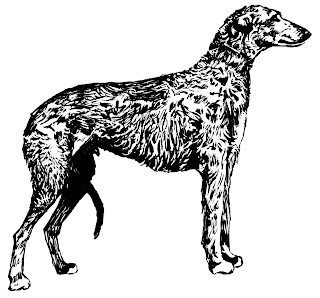 The Grey Dog’s other distinguishing features include an unearthly, wailing bark – in fact a vocal trait quite typical of real Scottish deerhounds, as is the ghost’s characteristic rough grey coat. According to Alasdair Roberts, whose recent Tales of the Morar Highlands (Edinburgh: Birlinn Ltd, 2006) makes mention of the tradition, the Grey Dog legend has morphed over the years, so that present-day Morar residents think of the hound as ‘a ghostly creature akin to a she-wolf – heard and even seen on stormy nights.’ In its original form, however, the tale is good deal more detailed than that, and bears retelling here. It may be noted, at this point, that the Grey Dog tradition is something of an archival nightmare to pin down. The earliest printed version that I know of appears in a little book by a Morar fisherman named James Macdonald, published in Inverness in 1907 and entitled Tales of the Highlands, by a Mod Medallist. (A mod is the Gaelic equivalent of a Welsh Eisteddfod; Macdonald won his medal as a fiddle player at the Oban mod of 1906.) Only two copies of this work are known to survive: one of them in anonymous private hands, and the other in the tiny Heritage Centre in the fishing village of Mallaig. A second key source, detailing the Canadian parts of the tradition (numerous Morar Highlanders emigrated to Nova Scotia in the course of the nineteenth century), lies in a Gaelic manuscript preserved in the Sruth nan Gaidheal collection of the St Francis Xavier University library in Cape Breton. The most recent account of the legend, meanwhile, is in Hungarian, of all impenetrable languages (‘Skot Kisertetserok I: Szellemek’, in EPONA: The Journal of Ancient and Modern Celtic Studies in Hungary, no.1, May 2007). It’s with some relief that the English-speaking Fortean turns to what is, in fact, the best and most detailed source on the subject, Iain Thornber’s article ‘The legend of the Grey Dog’, published, relatively accessibly, in The Scots Magazine of Dundee in May 1982. 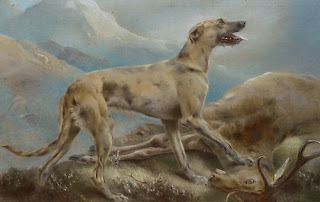 ‘the story of the Grey Dog dates back to the early 1800s at the time of the Peninsular Wars and is associated with a young Highlander by the name of Dugald MacDonald, who owned a magnificent deerhound of which he was very fond. Like many other men of his generation, Dugald went off to the wars and was away from home for several years. When at last he eventually returned he was told that his beloved dog had left home and taken up residence on an island in the middle of a small loch high among the hills and there had given birth to four pups. The pups were now almost fully grown, and he was warned that due to heir lack of human contact they were so savage that it was unsafe to go anywhere near them. ‘Ignoring the warning, Dugald set out to visit the hill-loch and on reaching its shores swam across to the island. The deerhound was away and her pups, on hearing him approach, emerged from their lair in the heather and tore him to pieces. When the deerhound returned and saw what had happened to her master, her howls of agony brought the folk of the glen to the scene. The pups were speedily hunted out and killed and Dugald’s body was laid to rest in the little burial-ground at the mouth of the Meoble River. ‘Here the deerhound began a lonely and pathetic vigil, frequently waking the neighbourhood with her mournful howling as she watched over her master’s grave, until one day she was discovered lying stretched out dead beside it. ‘Suddenly, spread before me, was the loch I’d come to see. In its centre stood the island, rising up like a large dark pyramid. 'In my travels throughout the Highlands I have seen many hundreds of loch-bound islands, but none so dramatic as this one. Even at a distance, I had been struck by its shape and colour, but now, viewed so closely against a backdrop of bleak winter hillside, it seemed even more impressive. It was desolate, dismal and frighteningly gloomy and moreover it had an atmosphere which, in every respect, would conjure up a scene of some terrible tragedy even to those not familiar with the saga of the deerhound. Even in black and white, Thornber’s photo of the isle (reproduced at the head of this entry) gives a good impression of its unearthly appearance, and a modern aerial photo (below) confirms the place’s very unusual bulk in proportion to the lake in which it lies. A minor wrinkle, meanwhile, emerges from a study of the Ordnance Survey’s detailed 1876 map of the district, in impressive 1:10,560 scale, which shows that the lochan in question has, rather unusually, acquired a new name since the birth of the Grey Dog tradition: its nineteenth century title was ‘Lochan Feith a Mhath-ghambaa’. This, a Morar local and my trusty OS Glossary of Gaelic Origins of Place Names in Britain combine to inform me, can be clumsily translated as ‘the bog of the fine stirk'. Did you miss the USA 132nd Westminster Kennel Club Dog Show from this Monday 11 and Tuesday 12 passed? We certainly did, living here in a wintered Scotland, but thanks to the wonders of Modern technology and a link supplied by Irish Wolfhound friends in Canada - we’ve now enjoyed some of the show. And if you wish to enjoy this event and the Scottish Deerhounds in particular, click here for the video. 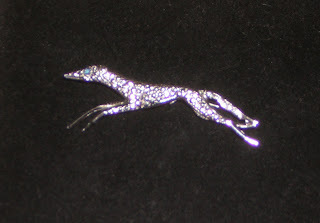 If a hound won’t run – do you whippet ?